The name for these worms literally means “many bristles,” which refers to the “legs” that they use to move through the water. These surprisingly fast animals are predators of copepods, appendicularians, and even small larval fishes. Most polychaetes are meroplankton, meaning that they are plankton only for their egg and larval stages. When they reach a certain size, they settle out of the water column and spend their adult lives associated with some kind of substrate (e.g., reefs, sand, mud, rock, etc.). A few species are holoplanktonic, spending their entire lives drifting in the ocean currents. 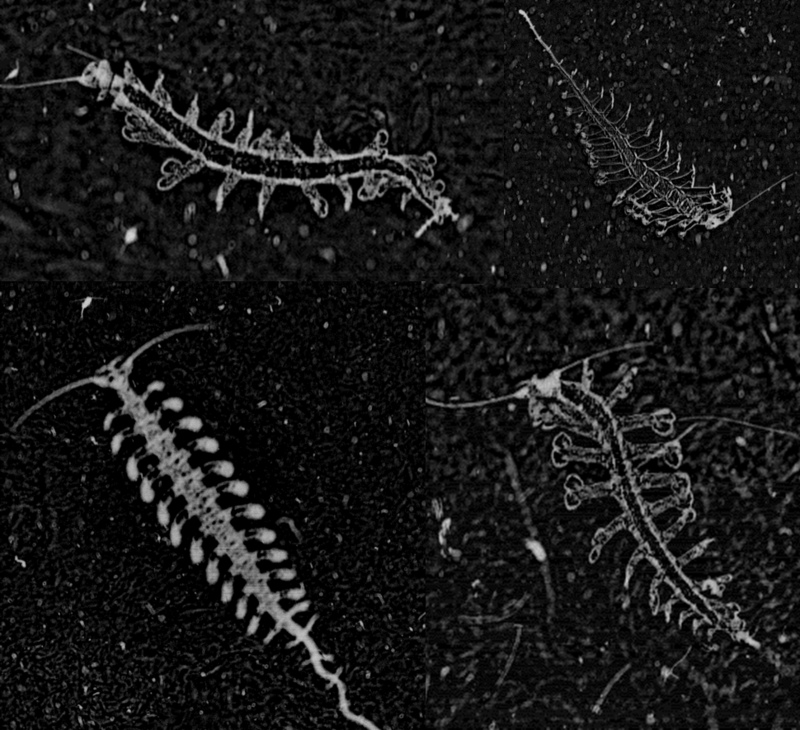 One genus of holoplanktonic polychaete that we have encountered in the ISIIS images is Tomopteris. These 2-5 cm polychaetes feature several adaptations that are favorable for life in water column. First, they are highly transparent, allowing them to blend into the surrounding water. If they could be easily seen, polychaetes would be tasty little snacks for fish. One thing that limits their transparency is a gut that runs down the middle of the body. When this gut is full, the polychaete is easier to see because it cannot hide a stomach full of food! Someone might hypothesize that polychaetes that have recently eaten might be more susceptible to visual predators, such as fish, but to date, no one has explored this question. Second, their “legs” have paddle-shaped ends with two lobes, which improve their swimming ability compared to other groups of polychaetes (Todd et al. 1996). Many of these polychaetes (Tomopteris spp.) are actively swimming. The gut runs down the center of the animal between the legs, but it is difficult to see in these images. Although polychaetes are relatively rare plankton, we did manage to see a good number of them near Stellwagen Bank, Massachusetts, USA. 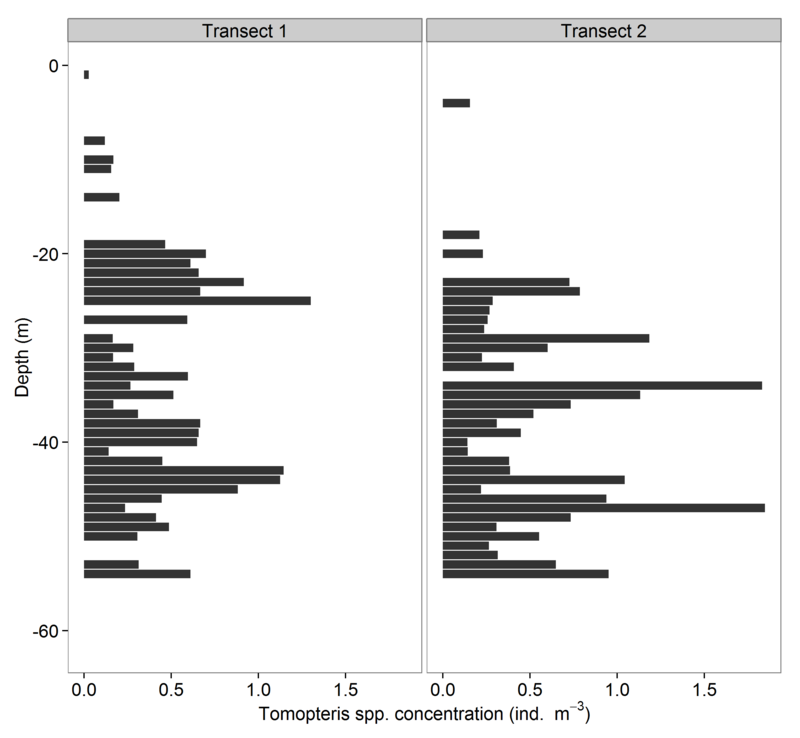 The graph shows the vertical distribution of the Tomopteris polychaetes along two ISIIS transects. As you can see, Tomopteris polychaetes were predominantly found in deeper waters. In the images taken, it is difficult to see the gut, which would show up as a white line running down the middle of the body. This means that these individuals had not eaten recently, so what are they doing in the deep waters? Possibly hiding from predators in waters with less light? Or could this behavior be related to mating? Only with further research can we find out what influences the distributions of these and other planktonic animals. Near Stellwagen Bank, Massachusetts, USA, many of the polychaetes tended to reside deeper in the water column. 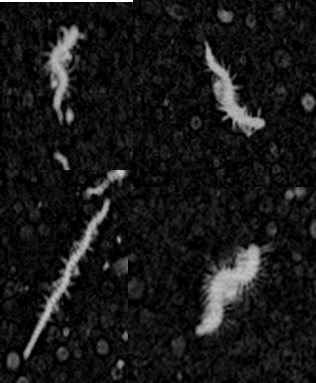 They are virtually absent from the top 20 m.
Unidentified polychaete larvae imaged by ISIIS in the Gulf of Mexico. Todd CD, Laverack MS, Boxshall GA (1996) Coastal Marine Zooplankton: A practical manual for students (2nd ed.) Cambridge University Press, New York. This entry was posted in Uncategorized by agreer35. Bookmark the permalink. thank you for your post, i love these fascinating creatures. It’s pretty tough to tell because it is quite small, but I do not think it is a polychaete. Most likely it is algae, possibly large chaetoceros – but I am not the best for identification of phytoplankton! ok, i won’t tag them as polychaete, thanks for your answer. but if you had any images of their larvae (made by isiis), i would like to see them.